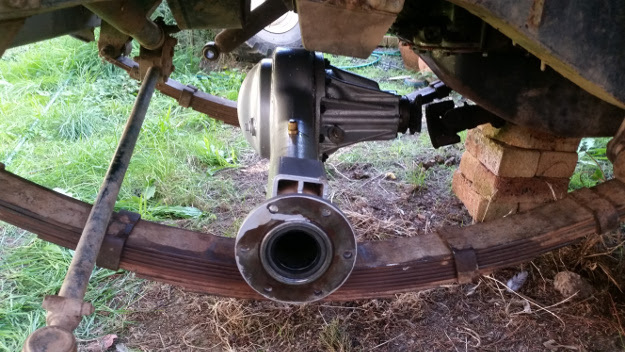 I've finally gotten to the point where I can start putting the hubs back on the Land Rover Front Axle. 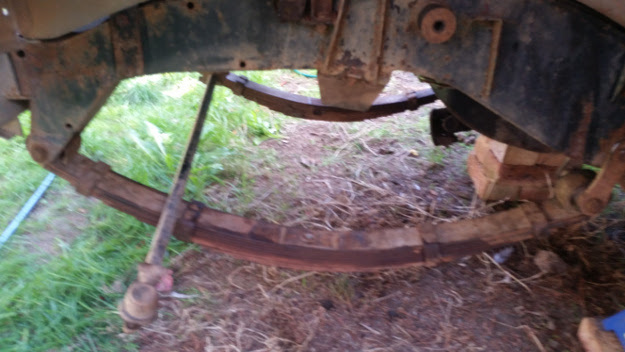 But first I needed to fix the passenger side leaf spring. 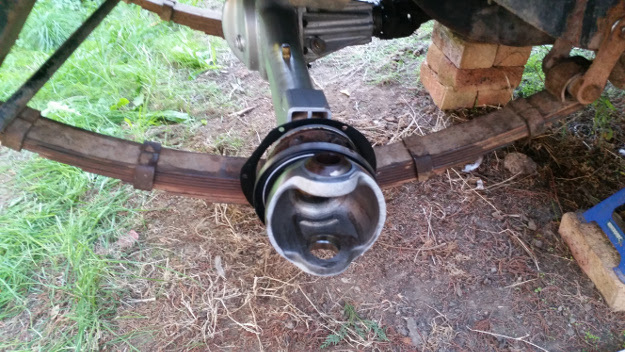 The pin that goes through the middle of the spring pack had shorn off at some point in the past and the axle was shifting around whenever you went over a bump. To fix this I just lined up all of the leaves. Some persuasion with a hammer was required to get all of the leaves to line up properly, but one they were lined up I could put a new bolt in. 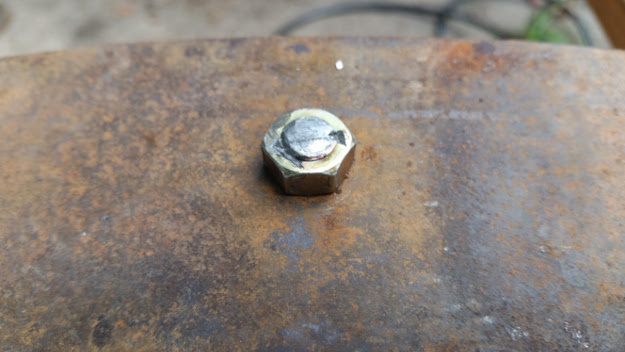 This bolt was only just long enough to get the nut on to start with. This left me with the problem of the rest of the bolt hanging out the bottom. 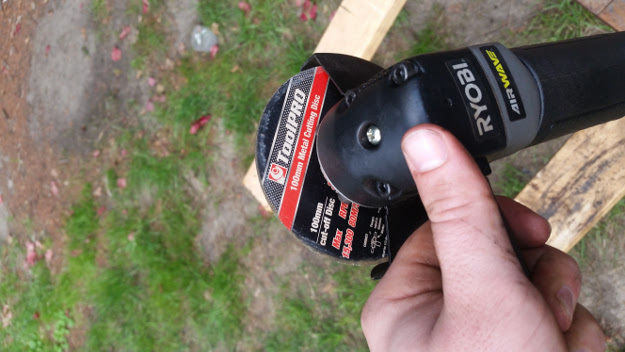 The best solution for this is to cut it off with a grinder. I do have an electric grinder and being battery powered it is very convenient. However I haven't been having much luck with the battery life on the small battery I have. I think this is largely down to the cheap discs I've been using with it. However this was a very good excuse along with cleaning up the housings and so on for getting a pneumatic grinder. While I was at the shop I also got some really thin cutoff discs. With the air tanks charged fully and the new cutoff disk this thing is a beast. 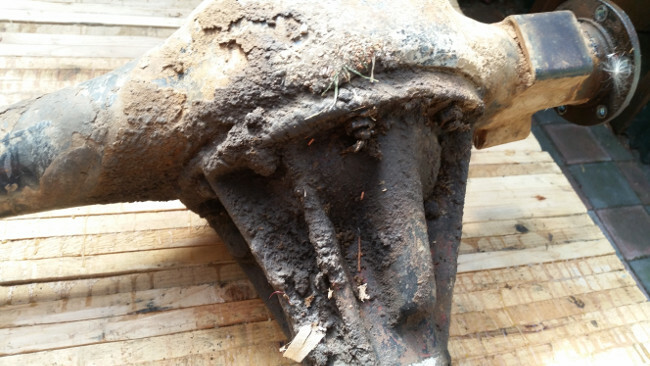 It cut through the high tensile bolt like butter. Unfortunately I found that if I'm running this for a while. 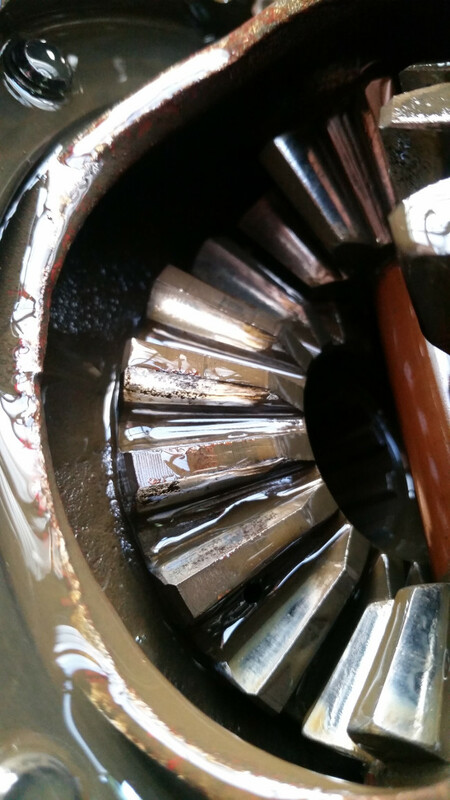 Such as cleaning up parts with a wirewheel it uses more air than my compressors can supply so frequent breaks are required to keep full power. I'd read online that you're supposed to take a hammer and peen over the end of the thread on the bolt so it can't come undone. That should be bashed enough now. And here we are, mounted in place. 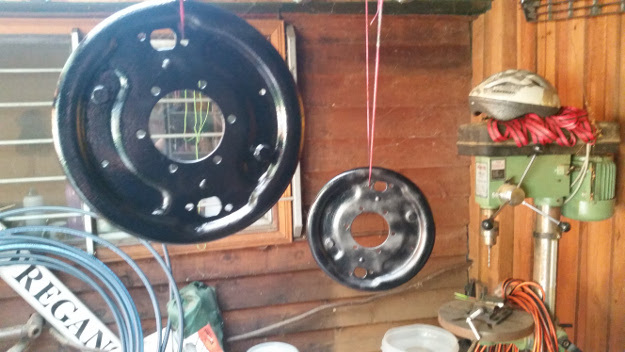 The same afternoon I cleaned up the brake backplates and started to spray them. I got them started before I finished everything else so I could keep getting the paint on them with fairly thin coats wet on wet. The paint is a caliper paint that will hopefully be a bit more resistant to brake fluid that I spill while bleeding the brakes out. 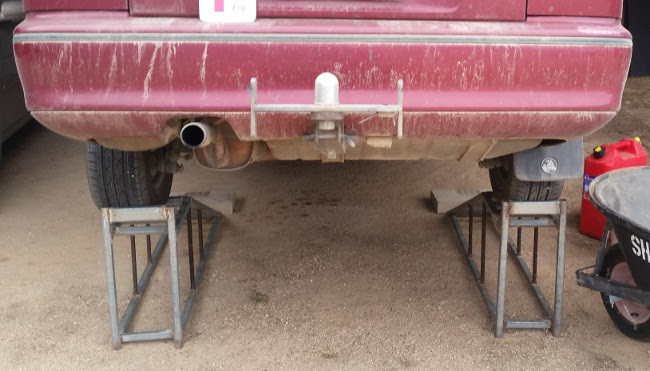 While I was on a roll I got the axle mounted up in place. Then to get a bit further on I put the swivel ball back on. Yes I did clean up the paint dribble on the flange face. That was a very productive afternoon. The pace has slowed a little since but keep an eye out for more updates. The other Saturday at Zig Zag we were able to move one of our wagons into the workshop to begin preparing the wagon for taking some of the scrap from the fire out from the workshop. I was on site and managed to get some footage of it. It doesn't look like a whole lot happening. However this is the first shunting movement we have made in a long time and we were able to just get the paperwork done, then do it. This is a huge step forward and is a sign of us getting closer to being able to run a railway. It's not just my cars that I spend time working on. My brother has been having problems with the car he's been driving recently too. So when I was up there I gave him a hand to test one theory we had as to what was causing it. While doing that I found a design "feature" that should never have made it into the finished product. Step one. Make life easy for ourselves. We had to drop the fuel tank out so having some room to work makes the job much easier. 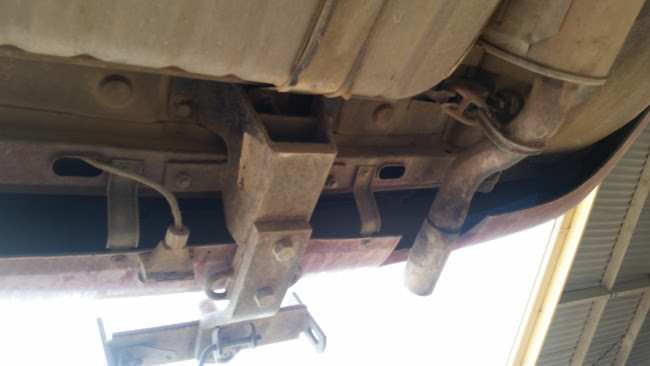 The tank on this car is held up with 2 straps that are bolted on at the back and allowed to pivot at the front. This means that after disconnecting all of the hoses, etc. all you need to do is undo 2 nuts and catch the tank. Can you see the problem in this photo yet? Whoever designed the towbar clearly did not expect anyone to be doing any maintenance on the fuel tank. And of course as the access decreases, the maintenance requirement goes up. So to drop the fuel tank you also need to remove the towbar now. 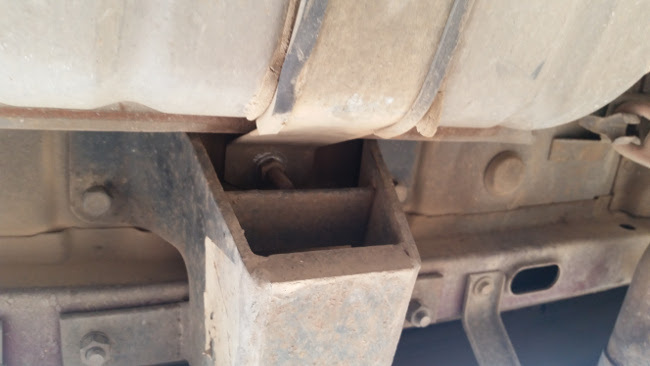 If they'd cut a notch out of the thinner plate in the middle of the towbar then you could get a deep socket in and remove the nut that way. That shouldn't make a catastrophic weakness in the part. It is what it is and we did get the tank out without too much hassle. But it is a good reminder to anyone who is modifying or building anything. 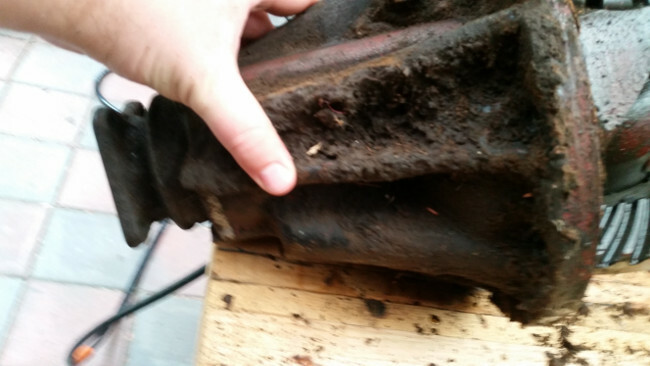 Always think about how YOU will maintain it and get to all of the parts required during servicing. Back to more Landrover stuff soon. 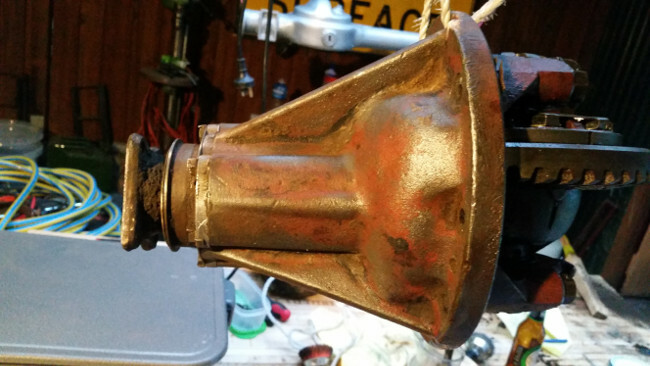 With the main axle tube getting cleaned up I wanted to get the diff housing cleaned up as well. Unfortunately it was very grotty before I started. This is what the whole lot looked like before I started. The engine above this had leaked a little over the years since this was last done and when that oil has combined with dirt and dust it has made a nasty greasy mess that needs to be removed. This is what the nuts looked like after I'd gotten a spanner onto them. Before getting them this clean I was wondering if there were even intact nuts under the crud. They were surprisingly good. And it will be easy enough to re-use them after cleaning them up a bit in some solvent. 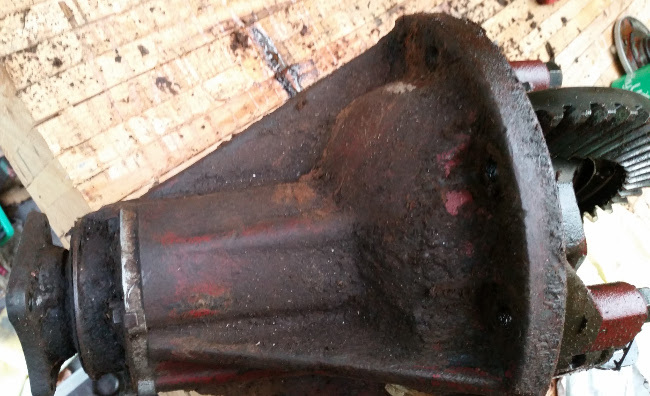 Because of the aluminium looking bearing housing for the pinion I thought the entire diff housing was aluminium. 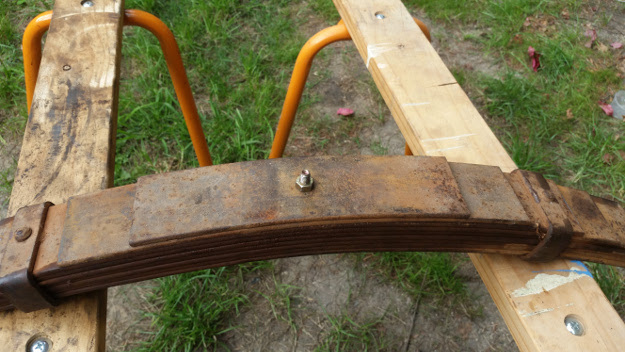 Because of that I wanted to avoid using a steel wire wheel on it in order to avoid scratching it or anything too badly. I found in the hardware store a nylon wheel. 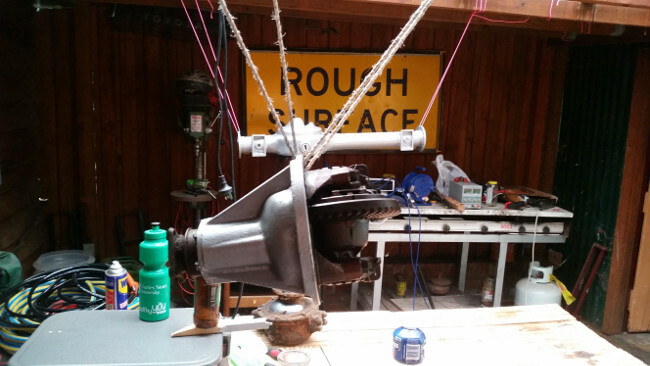 Like a steel wirewheel but with grit impregnated nylon bristles instead. I figured that would be a better thing to use on the relatively soft aluminium housing. However this was the result. After the nylon wheel not really removing the dirt I decided that it was time to just have at it. Shortly after I realised that it was a steel housing anyway so it didn't matter and using the nylon brush would have been a waste of time anyway. Unfortunately I did make some discoveries while I had the housing apart. 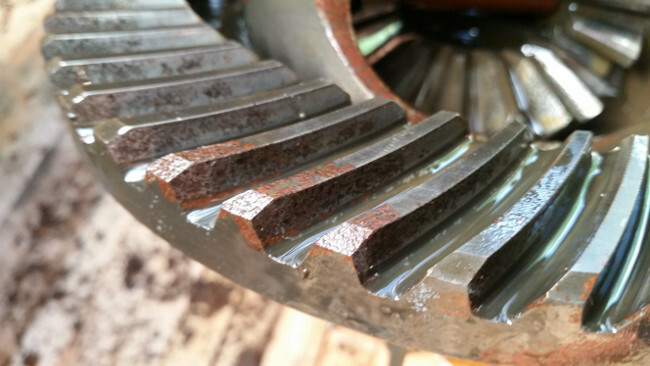 The gears are mostly in good shape, with no significant signs of wear. However there were a few spots that made me stop and think. While there is no worrying wear patterns. There is a little rust and pitting. This was a difficult point in this project because I want to do this properly. However to get a new diff essentially would take some time of saving up. These savings will also be needed for new tires as well so putting this on hold until I could get the parts to replace these gears would be a significant delay. Delays like this are what has caused me to loose patience with a project in the past so I have decided that I will put this back together and see how it goes. If the diff grenades itself in 2 years then I will be in a better position to get the parts to fix it. Also being the front the car will still be usable until the parts come. 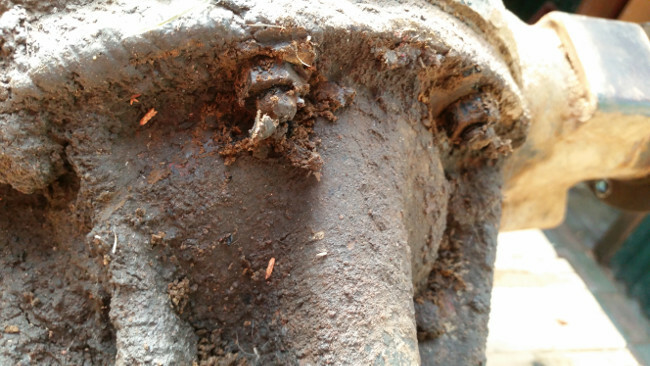 So the rust stays. For now. Forging ahead with that decision behind me I get the rest of the housing cleaned up. And so the diff became ready to be re-installed into the car.